I had a cat years back which had eyes with two different eye colors, one gray and one blue. The vet told me the condition was called Heterochromia iridis or Heterochromia iridum . Later after googling for this condition, I found out that it is not only restricted to cats and dogs but also found in humans. 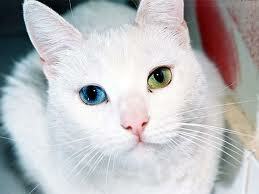 Heterochromia is a medical condition when a difference in coloration is present in the eyes, hair or the skin. It is caused by the excess or lack of melanin,which is primary for body coloration. It can be genetic, inherited or due to some disease or injury. 1) Complete- when one iris is of a different color from the other. I don't have a snap of my cat but it looked some what like this,except that its right eye was gray and not green. Looked really creepy at night. This picture clearly shows that the two eyes have two very different colors, the left iris blue and the right brown. The Friends with Benefits star, Mila Kunis has complete Heterochromia iridis, one eye brown and the other greenish hazel. 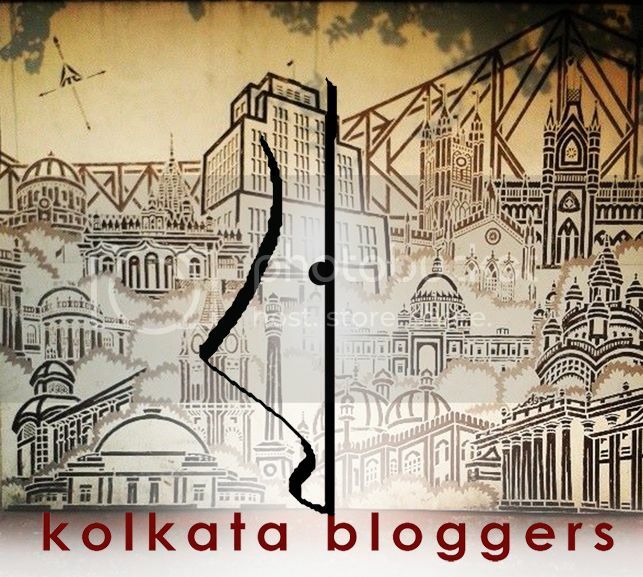 Click on the images to have a closer look. 2) Partial or Sectoral - Where two different colors are present in the same iris. This picture clearly shows how the same iris has two different colors, brown and greenish gray. These are Kate Bosworth's eyes. She has partial Heterochromia iridis, her left eye is partially brown. There is a special case in this category called Central heterochromia where the two irises are of the same color but the central region is of a different color from the peripheral zone. This is probably the most common form of Heterochromia iridis in humans. Clearly visible,this eye had a brownish coloration in the center whereas the rest of the iris is green. Have you known anyone who had or has this condition?? All images are taken from the internet and information is partially taken from wikipedia. My grandma had a cat named Ruby who suffered from this condition. I have not met any one in person (Homo sapien) who suffers from this rare condition though. Yeah cats are pretty common with this condition,I have known cats which changed their eye color from blue to gray as they grew up. why do you use the term suffer? They aren't suffering at all! I have Central heterochromia, I've always thought my eyes where a light brown but 4 years ago, one of my friends said I have green in my eye. I looked and she was right, I did. I'm 23 and I don't suffer from it. I just think I'm blessed and it just makes my eyes pop out more. Oh! That's sooo spooky. I would like that if i had it!! ! Hello Courtney, thanks for dropping by. Thanks for mentioning the book,I'll try to grab it. thanks for stopping by and leaving a comment. I haven't come across a human in real life though. I happen to have been blessed with centralized heterochromia. Uneducated people believe my eyes to be hazel when in fact they are green with the central flair of brownish/orange. Ironic that I have a 6 month old cat with complete heterochromia, we actually named her Chromia. And it IS scary to see her eyes at night. =) I really enjoyed this article. Wow...central heterochromia is actually the most fascinating to me. It makes the eyes look like the phase during solar or lunar eclipse. Lucky you!! Blue eyes with orange center is so cool!! :D I would love to see how that looks!! Perhaps you can send me a pic of your eyes,can you?? 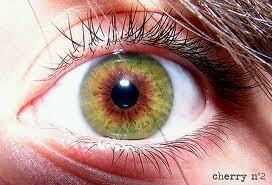 I worked as a nurse for cataract surgeon who looked at my eyes and told me that my eye color was very rare. Brown center, hazel/green perimeter. Many people think I wear colored contacts. I love my color eyes. I do feel blessed! Brown and green must look so amazing. Lucky you!! Who would want contacts when your natural eye color is that awesome!! I have both central and sectoral heterchromia. Both eyes have a brown ring around the pupil, but my left eye is half blue and half green while my right eye is completely green with the brown ring. The brown helps make my eyes look the same when I'm not in direct sunlight but when there's a lot of light, people notice my blue eye. I have heterochromia C: Blue and brown. This is a photo of my right eye close up. They are both the same. It doesnt effect my vision, I have fair to normal vision, that is easily corrected with glasses or contacts. I have hoshimotos disease, which is an autoimmune disease that causes my body to attack and kill my thyroid and I have to take synthetic hormone replacement... but I dont know if the trait is linked to that, or it is just a general pigmentation mutation. David Bowie had an eye injury when he was younger. It caused one of his pupils to be permanently dilated, and misshapen. My step mother has a pupil that is always dilated fully. Makes her look like she has one black eye, and one bright green one. She was born that way. I have partial and central heterochromia. My right eye is blue with a yellow ring, and my left eye is the same, save for the lower third being green with a brown ring. They can fix the color using lasers from stroma medical at $5,000. bucks. take the brown out to make it blue and they are perfecting the green color. 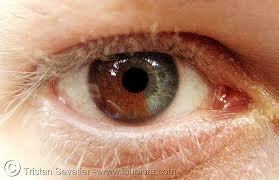 David Headley (terrorist) also has this condition in his eyes.